Alex Pereda is one of GKR’s top Karate exponents. At the 2001 GKR Karate World Cup, Alex won the World Open Kata Title and also gold for Team Kata. We asked Alex to share some of his tips for developing a winning kata. “Am I suited to sharp, explosive and dynamic Kata? – Such as Bassai-dai, Empi, Kanku-dai and Kanku-sho. Or more suited to the strong and graceful kata? – Such as Saifa, Seiunchin, Sepai or Kururunfa”. Our style, GKR Karate has given us the opportunity to learn both styles of kata. I’m not here to say one is better than the other. However, you may be more suited to performing one style more than the other. This may give you the edge you are looking for in the competition. Before choosing your kata, ask yourself, or instructor if need be, what elements the judges are looking for in this particular kata? Then ask yourself, can I provide that? Having said this, do not be over critical of yourself. This includes many steps. I liken it to completing a jigsaw puzzle. At times you may want to form the edges first (the pattern), finding some distinguishable pictures (certain moves that go together), and then trying to put them in place. Good kata takes time, as rushing to get results may lead to bad habits which will hurt you later. I suggest that even when you know the kata and are looking to perform it better, continue to take it apart in sections to get the moves and timing right. Once you have put it all together, develop your body’s understanding by performing all moves at a slow pace. When you do this you have time to fully concentrate on each technique. There will be ample time later to add your flare and power. 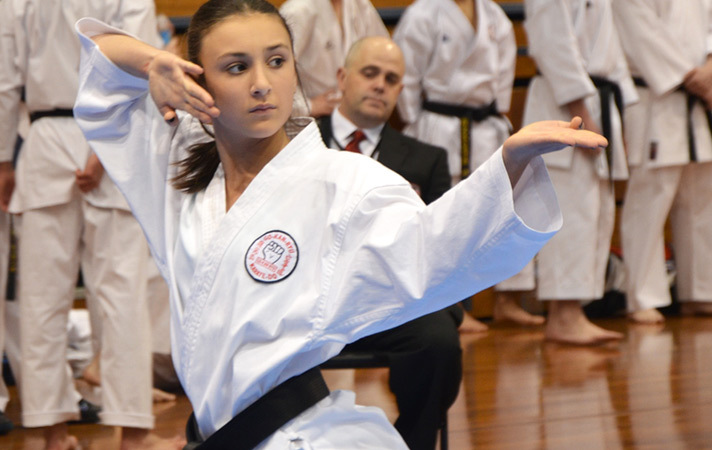 Who do you know who has performed this kata well? What did you like most about it? Once you have answered that, go to work on modeling your improvements until you feel energised by the way you perform it. Don’t be disheartened if it doesn’t happen straight away. Remember that person probably trained on it for years also. Challenge yourself to get better and better. Don’t let your ego get in the way. Ask them straight up for their help and advice and do make sure you listen to it. If you ask for help, but don’t apply it, that person may not feel it’s worth imparting any more advice to you. Fear causes us to perform at a level below our best. Many people are fearful in the ring while performing kata because it is often the first time they have had so many eyes on them. Having hundreds of eyes on you is a daunting thought, especially when you are used to the dojo, where only your instructor’s eyes are upon you. No matter how much you practise alone, walking into the ring will zap your confidence. One way to minimise this fear and build confidence to perform your kata under pressure is to ask someone to watch you. After some more time and improvement, perform it in front of your classmates, or at home in front of your family. You’ll have to get used to 5-10 sets of eyes watching you so that later you can handle a few hundred. At first, part of your focus will on those watching. This detracts from the focus your Kata deserves. Over time you will learn to remain focused solely on your Kata and it will seem as if no one is watching. Overall, kata is the reflection of your training habits. For example, if you constantly come out of stance in class, it will affect your leg strength when you need it. It may seem minor, but this habit will show when you perform kata and lack strength to stay low in stance, or move quickly through your stances for the duration of the entire kata. So get to enjoy the pain. Focus on what it will make of you, not only a better kata exponent but a more self-disciplined person. It is the little extra that you do, that can take you from ordinary to being extraordinary. This is a continual process. For this you must look for feedback. It could be comments from classmates or Instructors. One true indication is video evidence – the video won’t present biased opinions. Get to the nitty-gritty and refine each small movement. Don’t just focus on the major parts because often it is the small things that make the biggest difference and what will set you apart from the rest of the competitors. Its all in the mind and how determined you want to be. Kata and your karate spirit are very similar to life. We must have an idea of where we want to head and learn the lessons along the way. I see that each kata develops strength. This strength gained is needed to perform that kata well, but is also needed as a building platform for the next kata. If we skip the lessons, the same issues will arise again later, in life or kata.